Vitaminwater has landed itself in a bit of a marketing mess, and I can't say I didn't see this coming. The Center for Science in the Public Interest raised concerns regarding their marketing campaign. 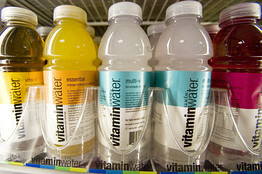 "The idea that you can improve your immunity by drinking one of these Vitaminwater drinks is nonsense," David Schardt, a senior nutritionist for the nonprofit group, said during a conference call with reporters. According to this group, Coke markets Vitaminwater as a "healthful alternative to soda and said the company makes a range of assertions, including claims that the drinks variously reduce the risk of chronic disease and support immune function. The nonprofit's nutritionists say the levels of sugar in the drinks promote obesity, diabetes, and other health problems." Diana Garza Ciarlante, a spokeswoman for Coke quickly retaliated and called the suit "ridiculous." "Glaceau Vitaminwater is clearly and properly labeled and shows the amount of vitamins and calories in the product," she said.